A chronic sub-dual haematoma is a brain disorder involving a collection of blood in the space between the inner membranes that cover the brain and the outer membrane covering of the brain, with symptoms occurring two weeks or more after the injury that caused the leak of blood. What is a chronic sub-dual haematoma? Chronic describes a condition which develops gradually and which lasts a long time.Subdural means below the dura. The dura mater is the outer membrane covering the brain. Haematoma means a collection of blood. What are the causes of chronic subdural haematoma? 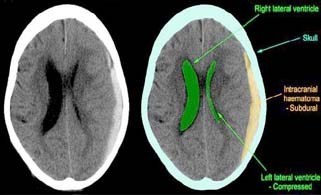 Chronic subdural haematomas are caused by injuries to the head. The head injury could be as minor as a bump, or as serious as a car accident. The blood slowly collects and presses on the brain tissue, which in turn can become inflamed. The growing leakage of blood, and inflammation can cause pressure on the brain, causing a gradual loss of brain function. Who is at risk of a chronic subdural haematoma?